After I made the original code puzzle, Ryan asked the very sensible question: "how does one handle multiple equal-length but different-sum subsequences". I'd not thought about that - and it wasn't part of the original question I was copying - but logic would dictate there's one of two answers here: use the first one; or use the highest one. I made the call to alter the rules to add the requirement that it should return the one with the highest sum. The CFML version is mostly more elegant code here, I think, but there's not much to it. needing to call a procedural-style function duplicate() in the middle of all the nice OO code is a bit crap. I've raised an E/R for this: RAILO-3248 and 3849074. PHP's shift() operation is a bit nicer than having to specifically delete the first item of the array. I've raised an E/R for this too: RAILO-3252 and 3853251. However - as I said - this is no good to answer the updated question. It's picking out the first longest subseries, not the highest one. 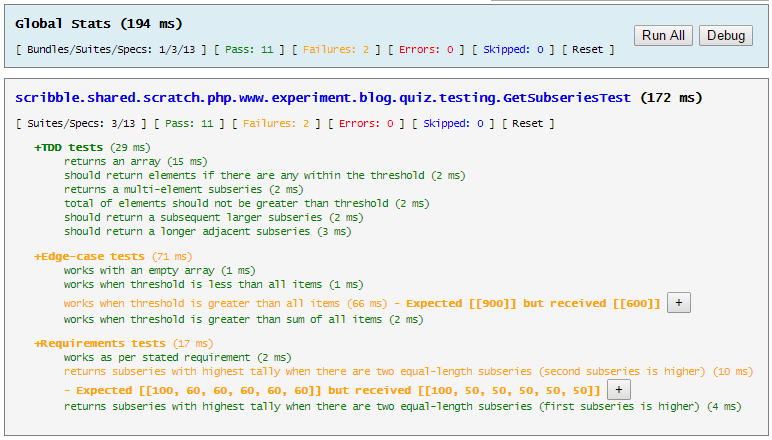 But we have a good test bed now, and I can watch for regressions when working on my revisions. Go the TDD! (and unit-testing in general). It actually took me a few hours and a bunch of iterations to get this right. I could have made this a coupla lines shorter, but I think the return statement was unclear when I had the conditions for workingIsBetterForLength and workingIsBetterForTotal inline. This also removes the logic error I had earlier. Previously I was removing one element from the beginning of the array every iteration, which coincidentally worked for the tests I was running. However it was actually not correct. What I needed to do is to continue removing elements whilst the subseries was over-threshold. If only because there's simply no point processing the result whilst the working array is over-threshold as it clearly isn't a valid result. Which would be a rare justification for a bodyless loop. However whilst Railo returns the resultant array from all the rest of its Array member functions, it just returns true from deleteAt(). Which bites. This is definitely not desired behaviour, so I raised a ticket for this: RAILO-3250. Note that the array member functions in ColdFusion all still return booleans, so the code would need to be more cumbersome still using CF. Brad's raised a ticket for this: 3844976. Still: the end result is OK.
And I have one last version to share: a Ruby version. Having done that, I'll look at other people's answers, and see if we can find a "winner".